In the news, there are often reports on flooding impacting communities around the world such as the current floods in Australia. Wondering what agent-based models exisit of floods I came across a rather nice paper and model by Dawson et al (2011) entitled "An Agent-based Model for Risk-based Flood Incident Management" which describes the coupling of ABM to a raster cell flood model. The movie below shows the basic functioning of the model. Dawson, R.J., Peppe, R. and Wang, M. (2011), 'An Agent-based Model for Risk-based Flood Incident Management', Natural Hazards, 59(1): 167-189. 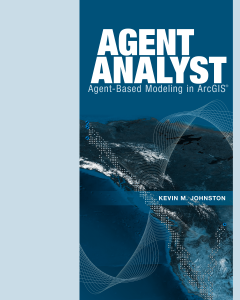 Anyone who is heavy user of ArcGIS and wants to explore how to create agent-based models within it should check out the new Agent-Analyst book from ESRI. After skimming through the chapters it looks like a great resource for teachers or individuals wishing to create geographically explicit agent-based models. There are a number of step-by-step exercises which show you how one can use points, polygons and rasters to create agent-based models. Also there is a discussion on how to create agents with simple behaviors. We have just been informed that our paper entitled "Demarcating New Boundaries: Mapping Virtual Polycentric Communities through Social Media Content" has been accepted in Cartography and Geographic Information Science (CaGIS). A point density analysis revealing hotspots in geolocated tweets. The proliferation of social media has led to the emergence of a new type of geospatial information that defies the conventions of authoritative or volunteered geographic information, yet can be harvested to reveal unique and dynamic information about people and their activities. In this paper we address the identification and mapping of global virtual communities formed around issues of specific national interest. We refer to these connected virtual communities formed around issues related to a specific state as the polycentric virtual equivalent of that state. Identifying, mapping, and analyzing these virtual communities is a novel challenge for our community, and this is the subject we pursue in this paper. We present these communities relative to established conventions of statehood, address the harvesting of relevant geographical information from social media feeds, and discuss the challenge of visualizing such information. In order to do so we use the current geopolitical situation in Syria as a demonstrative example. Below are some additional images from the paper. The user interface of our system prototype to harvest, map, and analyze streaming Twitter feeds. 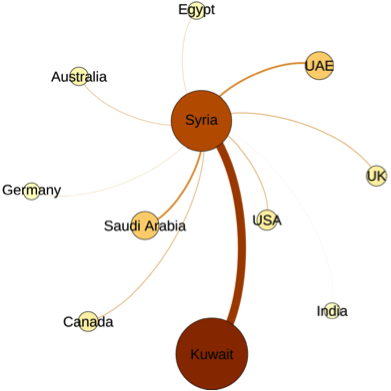 A network representation of the polycentric virtual Syria as it is captured using Twitter feeds for the period July 10-17, 2012 using a population-normalized participation indices. The size of the nodes indicates level of participation in the corresponding model. 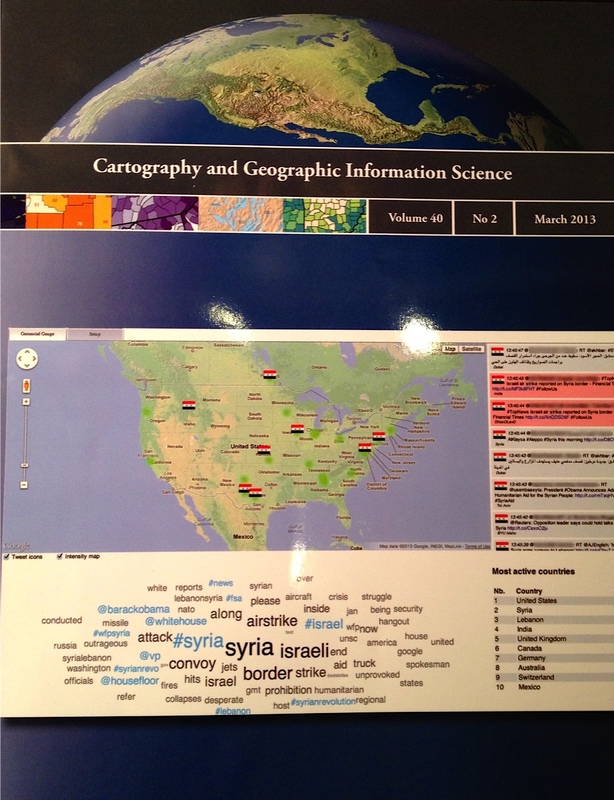 Update 10th of May, 2013: Our paper is now out and made the front cover of Cartography and Geographic Information Science.